Guru Rinpoche statue at Great Stupa of Universal Compassion near Bendigo, Australia. Photo by George Manos. One of Lama Zopa Rinpoche’s Vast Visions for FPMT is to build many large statues of Padmasambhava (Guru Rinpoche) around the world in order to create the cause for peace for all beings. To date, 27 statues have been built, one measuring 70 feet [21 meters] high! 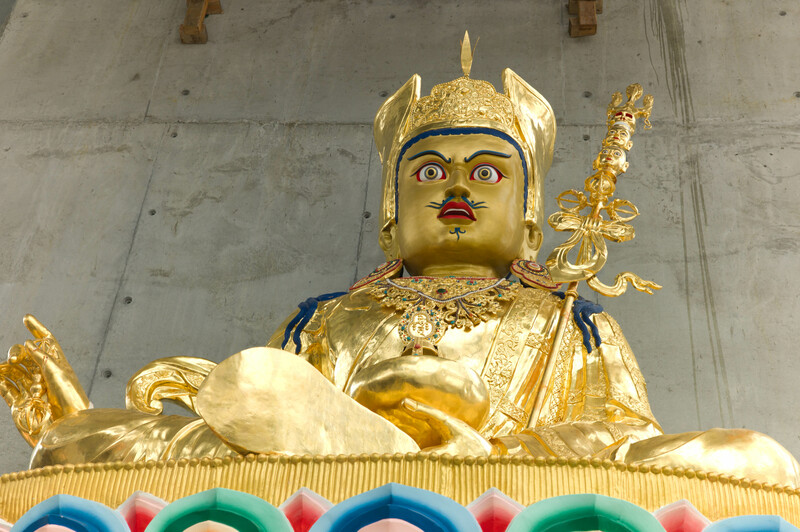 The Padmasambhava Project for Peace was established to fund the creation of Padmasambhava statues built in accordance with Lama Zopa Rinpoche’s wishes. Please enjoy a photo gallery of some of these amazing statues. 6.5-ft statue in Spain at Osel Ling, Spain. Or simply send your check in US dollars payable to FPMT Inc. and write “Padmasambhava Project for Peace” on the memo line. The Padmasambhava Project for Peace a project of FPMT Inc. and is administered by FPMT International Office located in Portland, Oregon, United States. All donations made to this fund are tax-deductible within the United States in accordance with IRS Code article 501(c)(3) to the extent allowed by law.